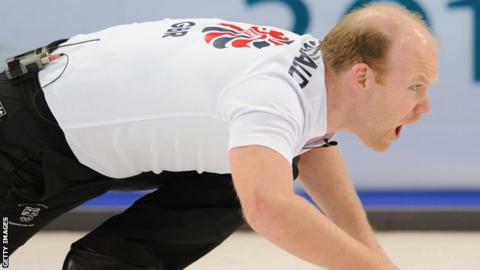 Scotland ended a disappointing World Men's Curling Championship by finishing ninth in the round robin after a 10-3 defeat by Germany. Thomas Ulsrud's Norwegian rink topped the table with only one defeat in their 11 matches in Beijing. Norway will face second-top Canada for a place in the final. The loser will get another chance to make the gold medal game after a series of play-offs involving Switzerland, Sweden and Japan. Canada and Switzerland also made the page play-offs after finishing second and third, with Sweden and Japan in the play-off spot. Ewan MacDonald's Scots finished with only three wins. The men's skip, whose rink are the current Scottish champions, is a three-time world champion himself but has not competed at this level since he was part of David Murdoch's rink in 2009. Murdoch, who led his team to a silver medal in Russia, was ineligible to compete as his team were representing Great Britain at the Sochi Olympics. Eve Muirhead's women's rink took bronze in Sochi but was also ineligible for last month's world championship, where Kerry Barr's Scots finished 11th of the 12 teams. Scotland lost their opener in China to Sweden 8-4 and were beaten 11-8 by the hosts then 9-4 by Japan before recording their first win, 10-9 against Switzerland. They were then edged out 7-6 by Denmark before their second win, 8-6 against United States. However, a 6-5 defeat by Czech Republic followed by a 6-4 loss to Norway ensured that they will cannot even qualify for a backdoor tie-breaker into the play-off. They defeated Russia 7-5 but then lost to Canada by the same margin before their final defeat by Germany.